The Pyramid Principle is the international best-seller on how to produce crisp, clear, compelling business writing. 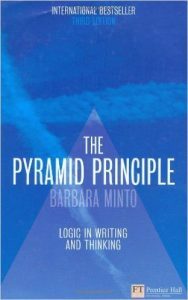 Tens of thousands of people worldwide have benefited from former McKinsey consultant Barbara Minto’s famous Pyramid Principle. Can your writing do with it?